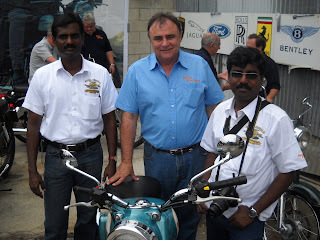 Royal Enfield India sent two executives to a fun "vintage" motorcycle show in Venice, Calif. July 11. The P.A. system noisily hawked raffle tickets and motorcyclists glanced with curiosity at a display of Royal Enfield motorcycles. What are Royal Enfield motorcycles, some must have wondered. Something new? The U.S. market is important, senior manager for international business Andrew Anantharaj told me, although right now the United Kingdom market is bigger. "But we have not been in California, we have never been in California, and this is where you sell the maximum number of motorcycles." I promised him I would not ask him to reveal any secrets, and he responded with a smile that "there is nothing secret about what we do." But then he told me that Royal Enfield's fantastic looking café racer will come to the U.S. when it rolls out in a couple years. 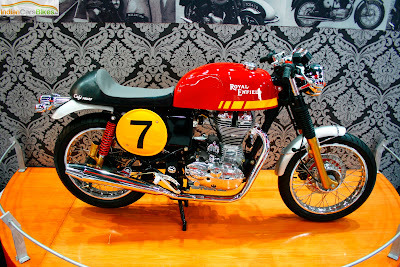 The café racer got a "tremendous response" when it was unveiled at Auto Expo 2010 in New Delhi, and it will be applauded in the U.K., home of history's first café racers, Anantharaj said. "But we are not sure one size fits all. That is why we are here." The people who buy the Royal Enfield café model will be knowledgeable about what a café racer is, he said. "We want to make sure we bring everything the market expects." I kidded Singaravelu "Siva" Sivakumar, Royal Enfield's head of industrial design, about the camera around his neck; was he looking for ideas at the motorcycle show? Not really. "We know our market, and we are claiming it," he said. "We are here to validate some concepts." The two executives from India and Royal Enfield USA President Kevin Mahoney were doing that by conducting focus groups at three locations in California: one in Venice, and others in San Francisco and San Diego. Royal Enfield will retain its retro reputation, and all the fun that goes with it, while coming completely up to modern standards, Sivakumar said. After all, "We are not selling motorcycles," Sivakumar added. "We are selling motorcycling. We want the motorcycle to be fun right from the first moment." This explains why the new C5 model has its classic looks, yet improved power and reliability, and less demand for maintenance, he said. with Royal Enfield USA President Kevin Mahoney. Great news!! Love the profile. But will it do the ton? I was at the Venice show and much to my surprise when I looked at the bottom picture that is me in the background with the gray polo (and gray hair) sitting on a G5, my intended purchase. I first saw one at South Bay Triumph in Sept 2009 and again at the Long Beach show in November. I keep asking when they will finally be for sale in California and the answer keeps drifting into future. One of these days!!! William, thank you for writing. I checked, but I do not have any better pictures showing you. When you do finally get the G5 be sure to send me one. All best.